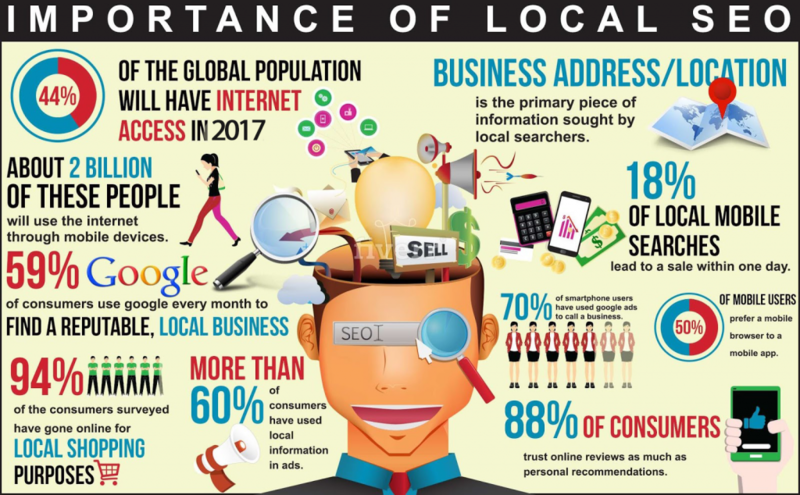 Why Your Business Requires Local SEO? Local SEO – Search Engine Optimization (SEO) is the procedure of increasing a website’s position in search engine results pages or SERPS. Like Google, Bing & DogPile. Creating a site that’s easily navigable by users and search engines helps search engine to understand your website. Following correct optimization to #tags & #terms help your site to rank at the top of Search Engine Results Pages (SERPs) for the products and services you offer. An integral part of local marketing is Local SEO is, as site extensions, localized keywords, and community-driven content result in better brand and site recognition for people in your area. Focusing on measurable growth and results, we use SEO expertise to create a strategy that can bring your business to the forefront of your region and help you build long-term success. How Do You Incorporate Local SEO into Local Marketing? We place your business’s NAP consistently throughout your site, which makes your business more visible to search engines. Citations ensure your NAP is listed uniformly everywhere on the internet, in the same consistent way it’s displayed on your site. We create business listings on directory sites such as Yelp, SuperPages, Foursquare, UrbanSpoon, and much more to allow people to leave reviews and give potential customers a snapshot of your business. Social media reviews are just as important, as they generate word of mouth exposure and build a dialogue with your customer base. Our social media management solutions help develop those discussions while we collaborate with you to incentivize interactions through sales, specials, and giveaways. Managing, verifying, and editing your business information on Google may seem daunting. Our team works with Google My Business to ensure your listing is customized with a photo and description, with correct categorization and a reduction in confusing duplicate listings. Google ad extensions are a great way to give potential customers more information about your business. They also encourage people to visit your website and increase your brand’s authority. Through extensions, your search returns can list your phone number, location, and reviews. Our team incorporates these extensions seamlessly, reducing your bounce rate. Local news coverage offers targeted opportunities for link building. we utilize HARO, a powerful resource that connects journalists and businesses to one another. Offering knowledge in your industry to a verified news source ensures that their readers are routed back to you and your website. There are many different strategies that incorporate these methods to improve a website’s rankings and CTR (click-through rates). With our expertise, insight into many industries’ best practices, and years of experience, we will help grow your business in your community. In addition to our current SEO strategies, we have specific methods for increasing traffic and sales for localized businesses. We build on our fundamental methods of SEO success to create a more targeted approach towards consumers in your area. Our team uses programs that analyze which keywords work best in your localized area through search volume and trend reports. We ensure your site is user-friendly with an emphasis on enjoyable user experiences. Your site needs to answer the most important questions a visitor could have: where you’re located, what your hours are, and what products or services you offer. We conduct extensive keyword research optimized for your city or region. A schema is a code that you may implement in order to help search engines return more informative and relevant results for users. Schema markups tell Google what your data means, not just what it is. We’re experts in implementing schema markups seamlessly, ensuring searchers can see a website’s purpose on the SERPs. We recommend taking advantage of every opportunity for exposure, as it requires you to stay active and engaged within your community. Local events are great opportunities for more insight into possible keywords, branding opportunities, and feedback from your customers, so we make sure to reference them. We’re at the top of our game. Are you? Get the Help your business deserves Contact us.